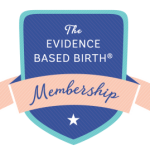 Join the Evidence Based Birth® Professional Membership and gain access to our community and in-depth training on how to help your clients get evidence based care. You have chosen the annual plan at a rate of $447 per year. On the annual membership of your join date, you will be billed automatically; we will send you a notice before you are billed.